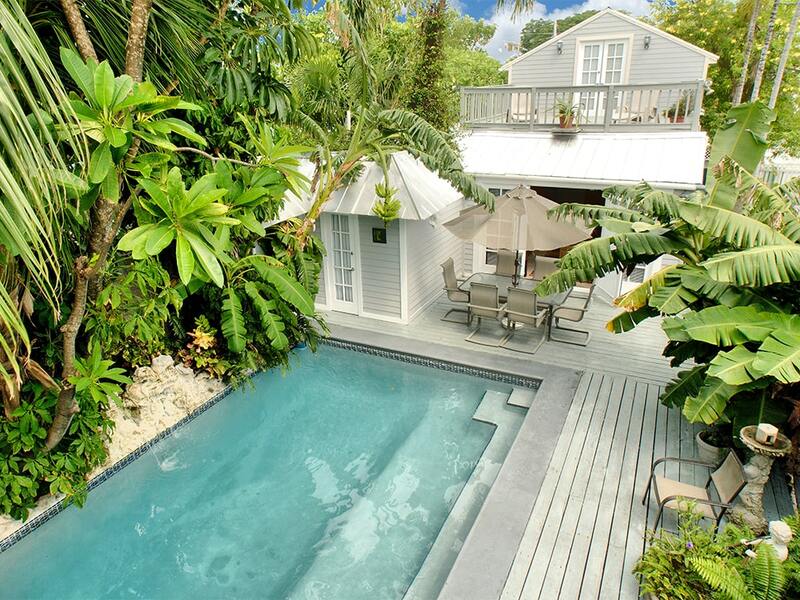 Genuine ‘old-world’ charm meets modern tropical luxury in this wonderful historic island home. 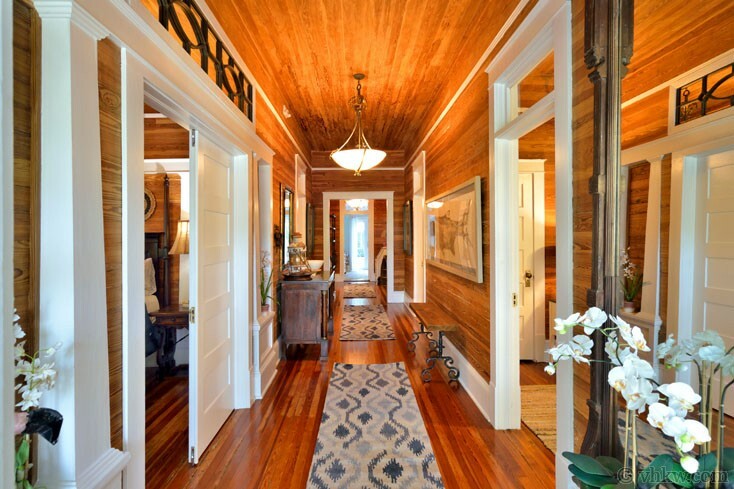 Built of original glistening clear heart pine from floor to 12 foot ceiling, the immaculate interior rooms radiate a warm and magical feel that would be nearly impossible to replicate by modern builders. 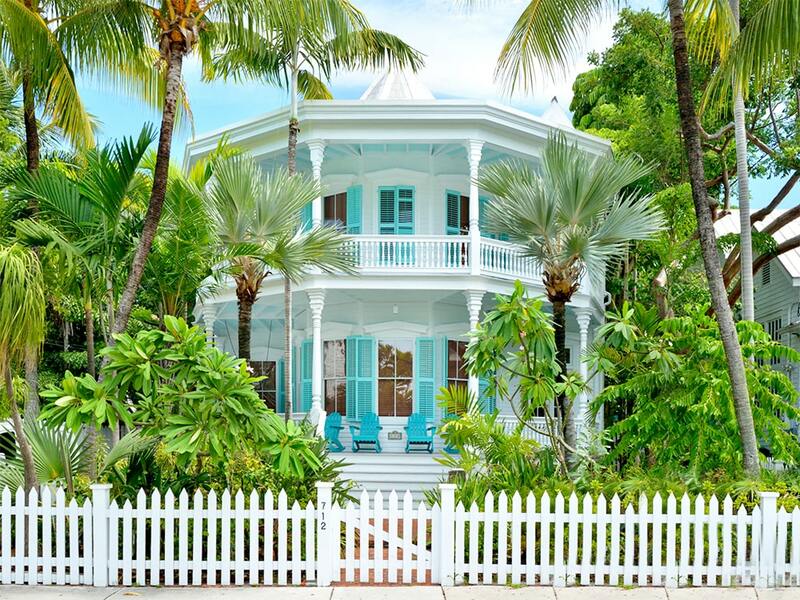 Built in one of the most long-lived and well-loved styles of American architecture this romantic Key West home displays classic lines of renaissance-inspired symmetry. 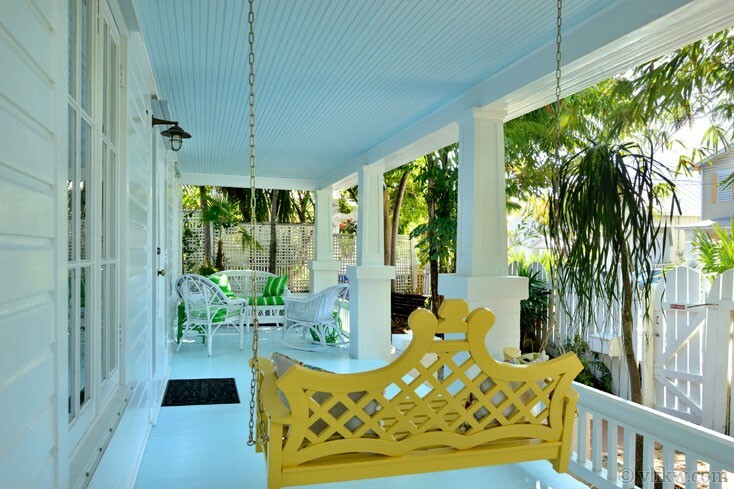 Deep spacious living and bedrooms off a wide center hall, high ceilings, detailing with classical white capital-topped columns, transom door lights at the front entrance, and a side-gable roof all suggest this home it is one of Key West’s few American-Georgian colonial style homes. In October, 2015, impressive changes and updates were completed in the layout and furnishings of this beautifully renovated home, by new owners. 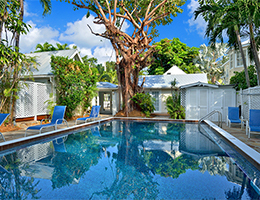 With a passion for Key West wooden homes and an eye for luxury design, a local craftsman builder added a third bathroom, fourth bedroom, and outdoor shower near the poolside cottage. 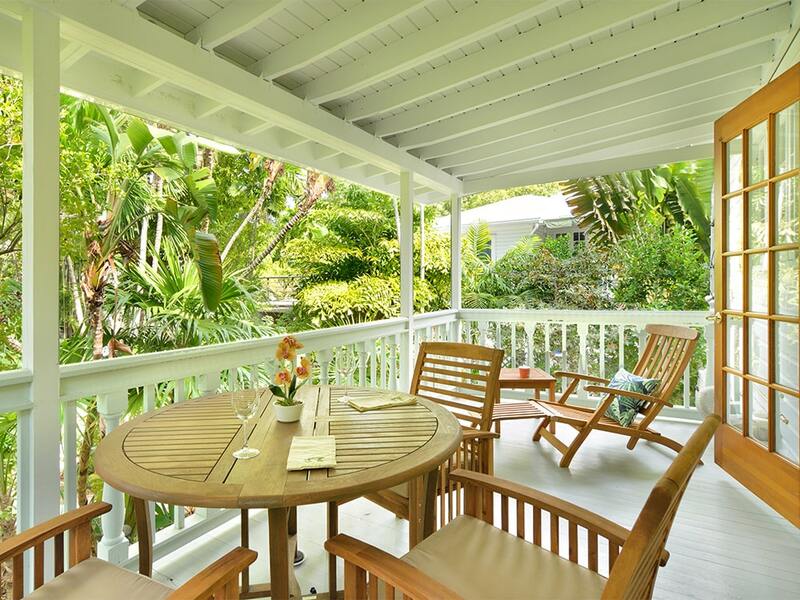 A spacious home built on a large Key West lot, the home now feels as if it's complete, living up to its full casually elegant potential. 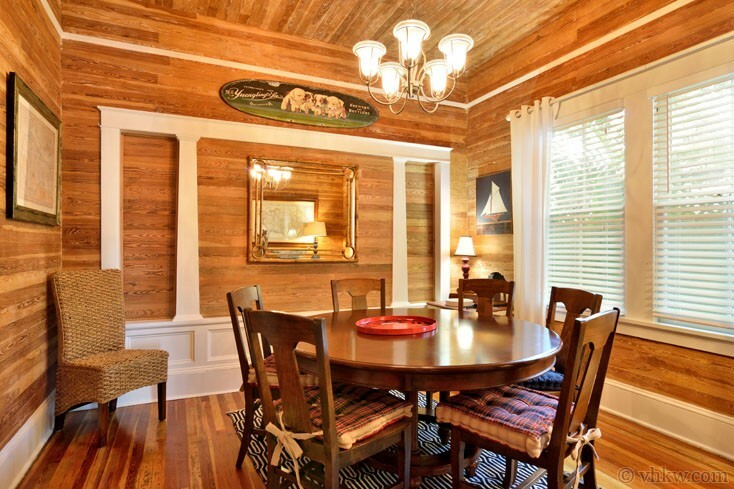 During the first renovation of this home, the historic Dade County heart pine walls and floors were refinished to reveal the natural golden gleam of this remarkable wood, making a beautiful back drop for hanging wall art. Another noteworthy feature I love about this home is the retro black cast iron and porcelain claw foot tub selected for the master bathroom. Perched on elegant silver painted fan-leaf feet, the tub is a perfect contrast to the custom Aztec patterned black and white tile floor. An elegant canopy rain shower fixture is beautifully framed with a clear glass shower enclosure making the bathroom artful in and of itself. 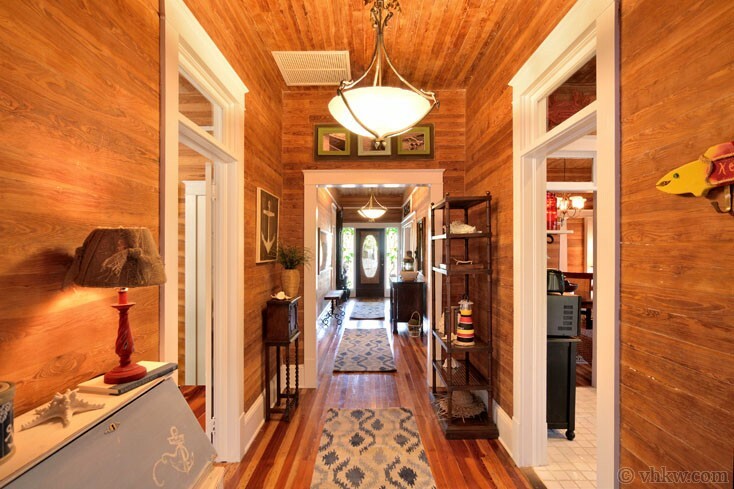 As you face the front of the house the front door entrance steps into a wide center hall leading all the way to the back of the house. The high ceilings make the hall feel grand and its extra width invites it to also serve as a long spacious sitting room. 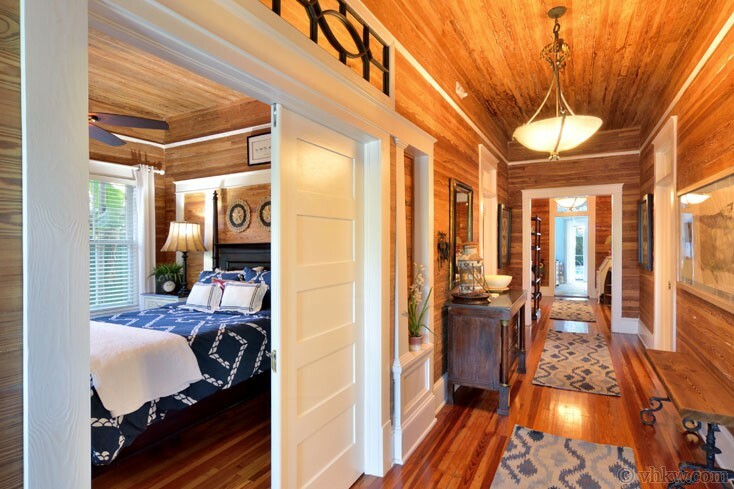 Once inside the hall, the first bedroom we show you is the front bedroom on the left (guest bedroom 1), with impressive colonial style columns and architectural details. 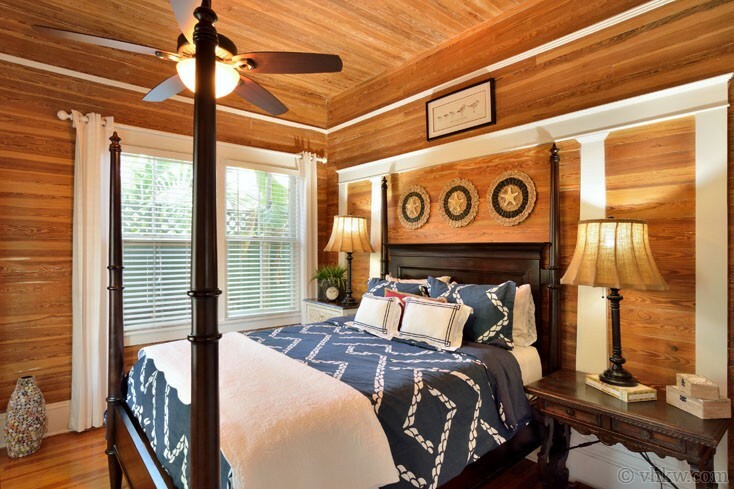 Set with a queen size 4-poster mahogany bed with complimentary nautical antique furnishings, this romantic bedroom is beautifully staged against the original Dade County golden pine walls. The dining room is the next room in line, furnished with a beautiful round wooden mahogany table, large enough for everyone to sit together and enjoy a meal. Connecting with the dining room, at the back of the house on the left, is the fully equipped spacious kitchen. 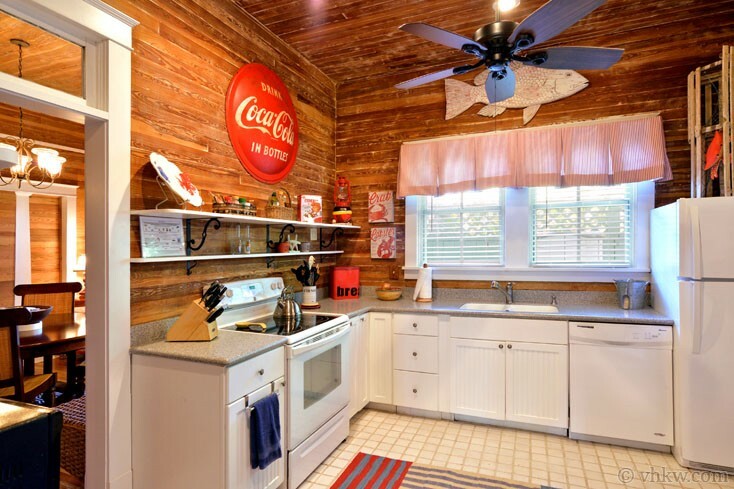 ​The kitchen make-over carefully considered the charming vintage qualities of the home, while adding making all the desirable conveniences. 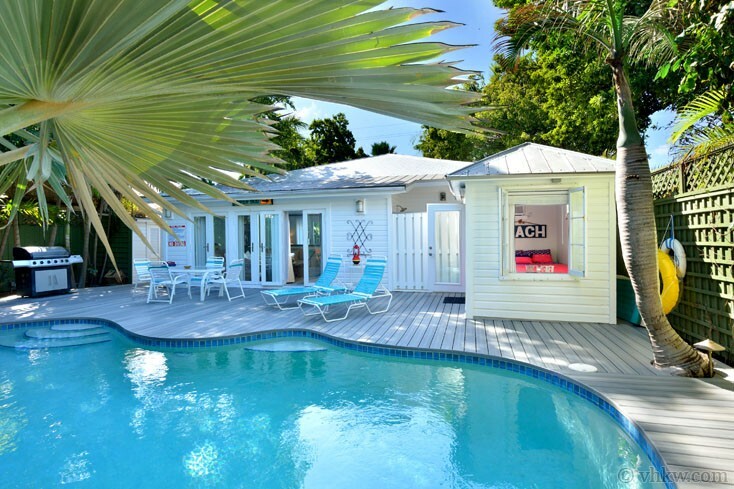 Adjoining the kitchen, is tropical ‘pool bath,’ which has an exterior door leading to the back deck, making it easily accessible from the main house, the swimming pool, and the private poolside cottage described below. 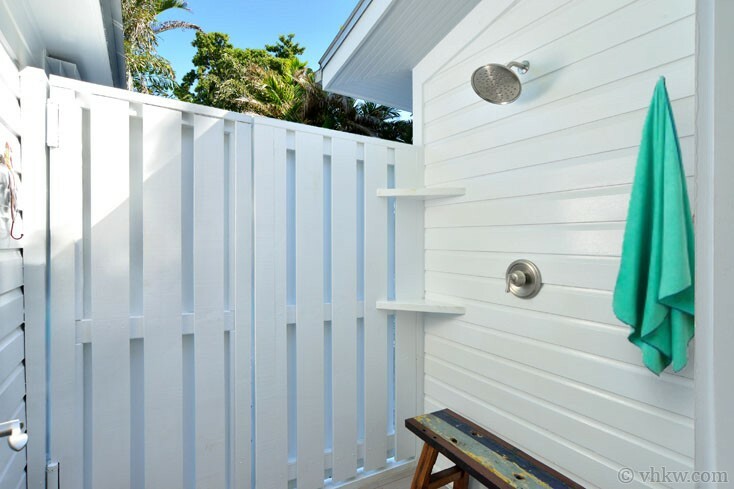 The shower for this bathroom is a Key West style privacy ‘outdoor shower’ situated directly outside the exterior door, and right next to the poolside cottage. 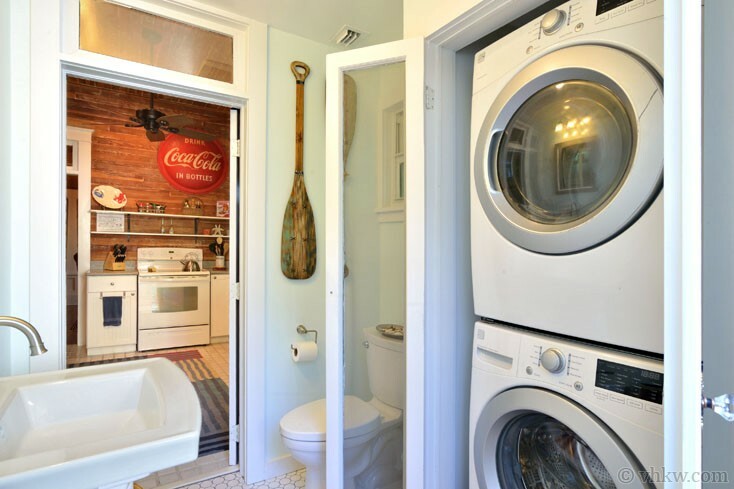 This bathroom also houses the laundry closet with a stackable washer/dryer. Returning to the front of the house, looking down the hallway towards the back of the house, the first room on the right is the front-right bedroom (guest bedroom 2). 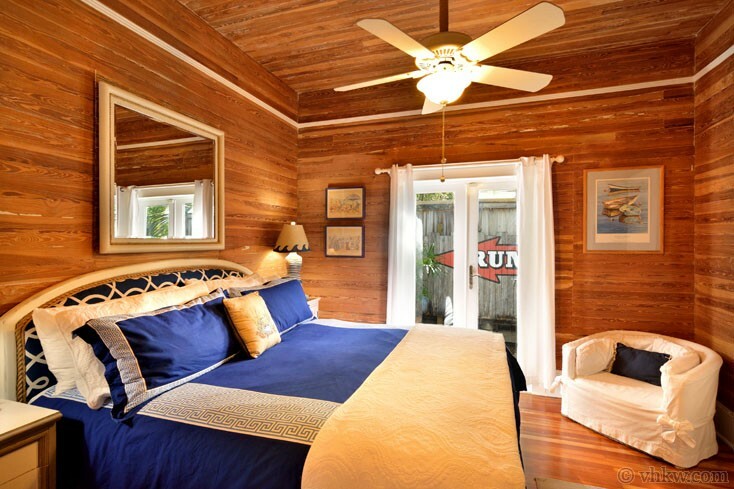 This is a spacious bedroom with an attractive décor offering a queen size bed with brown wicker headboard, and adorable 'Caribbean blue' dresser, and oceanic artwork. The next room down the hall to the right is the master bathroom which features the elegant cast iron claw foot tub described above. 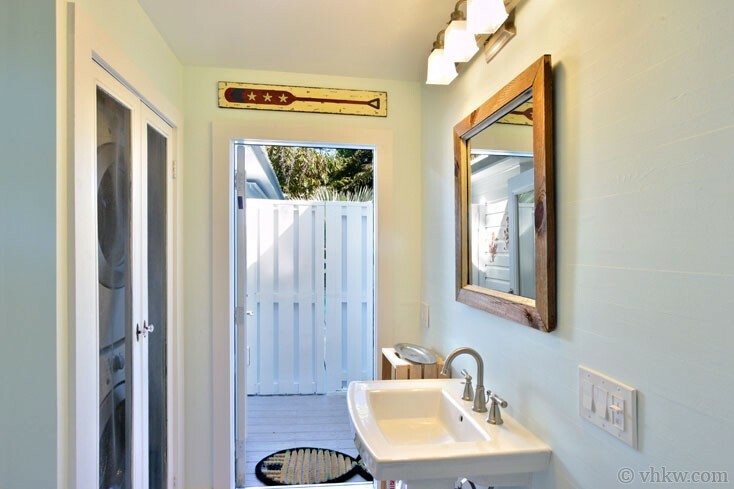 In addition to the artistic bath tub, the master bathroom has a beautiful oversized vintage style free-standing porcelain sink. 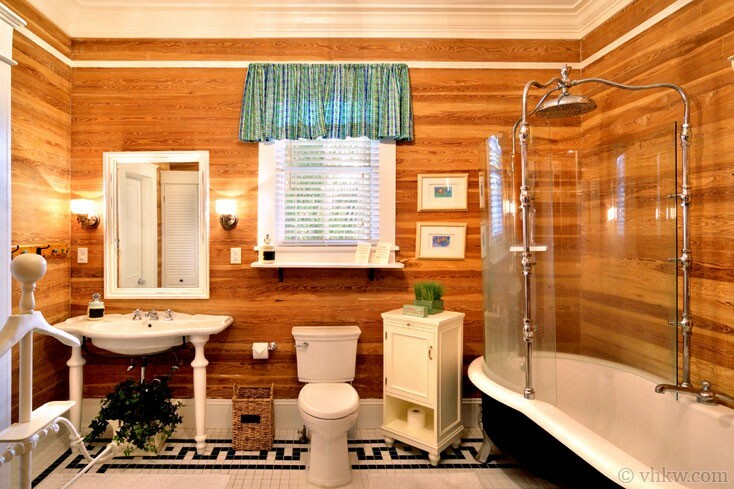 This bathroom has two entrances and can be accessed from the hall as well as the master bedroom. Continuing down the hall, the next room on the right is the spacious master bedroom which offers a king size bed appointed with a nautical blue and white headboard. 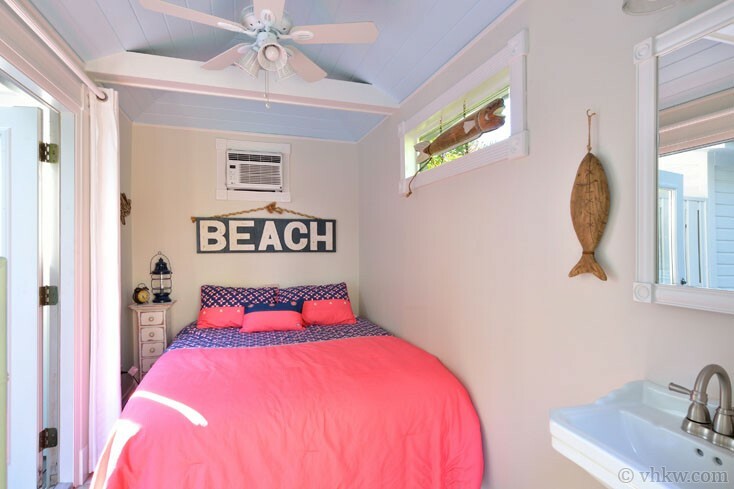 Shown dressed in matching nautical blue and white comforter in our slide show, this bedroom has a set of double French doors that open to the side yard and serve as a great source to invite in the morning sunshine. Proceeding all the way down the hall to the back of the house, and spanning three quarters of the width of the house, is the spacious pool-side family room. Extending the length of the house, between this room and the large outdoor pool deck, is where you’ll probably spend most of your time with friends and family. 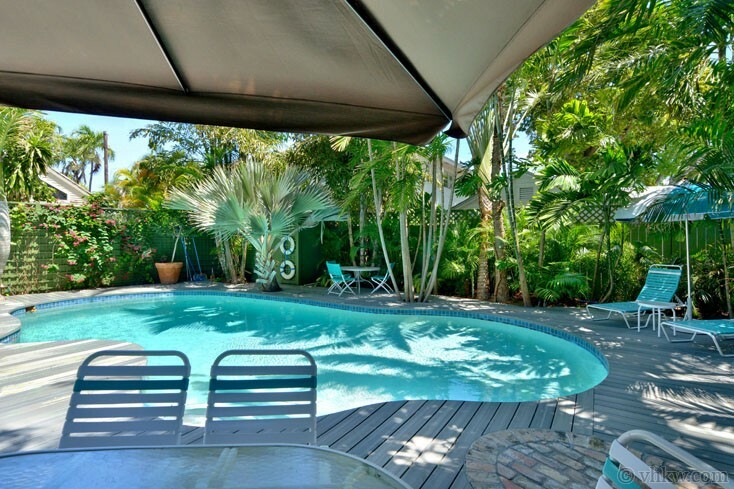 Three sets of double French doors lead to a spacious deck and 40 foot free-form heated swimming pool. 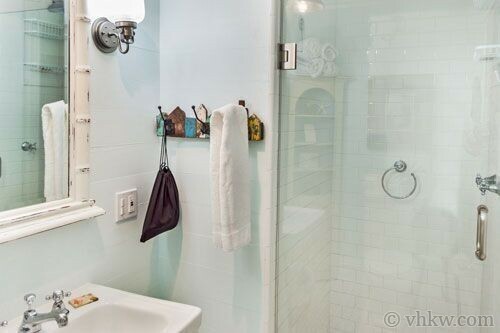 Directly off the living room, is an elegant full bathroom offering a free-standing sink tiled shower with frameless glass shower door, and upscale bathroom fixtures. 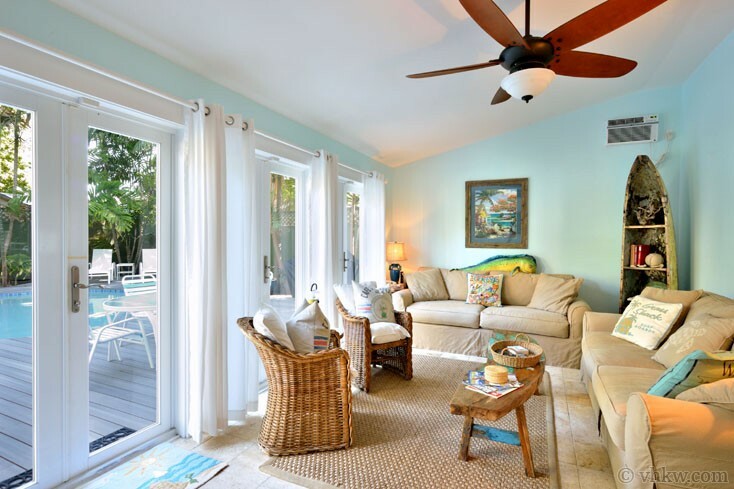 The last room, is the adjacent intimate free-standing pool-side cottage, nestled directly off the back deck just outside the living room, and off the pool-bath. 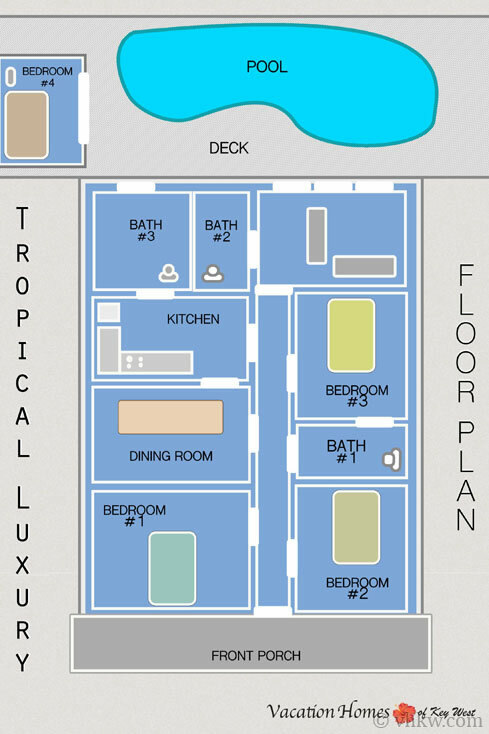 This adorable tropical bedroom offers a queen size bed and an added feature of a personal small free-standing sink. 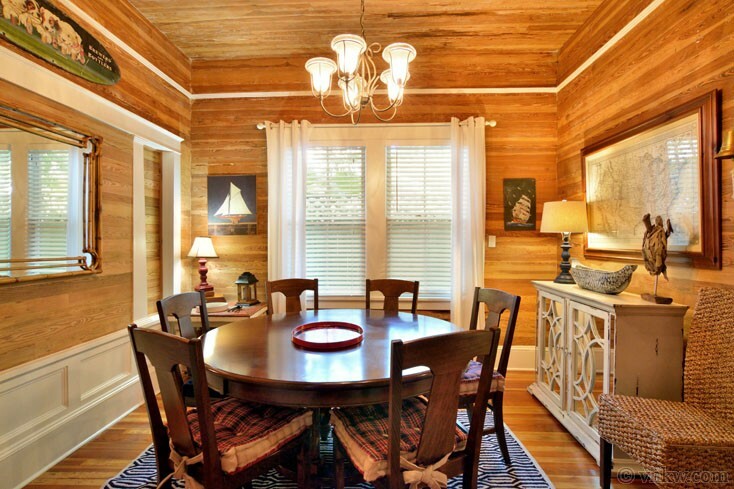 I love this room as it reminds me of a sail boat 'state room.' The location of this little cottage room creates a ‘secret’ bedroom with its own set of French doors offering a view of the swimming pool and a quick escape for a private early morning dip in the pool. 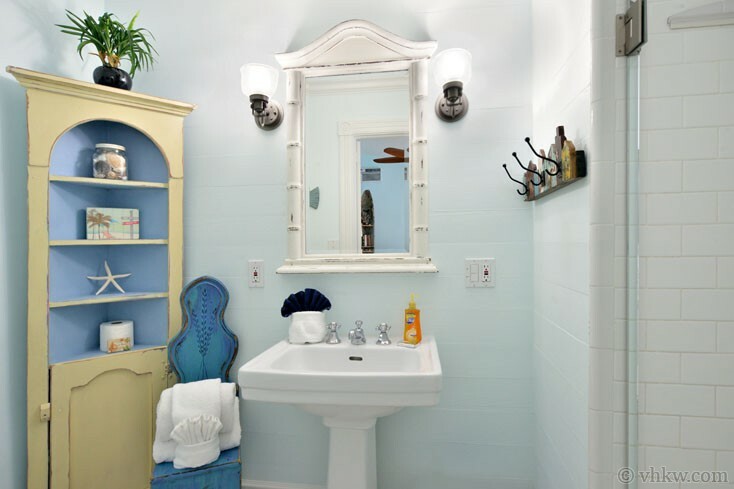 The bathroom for the pool-side cottage bedroom is the pool-bath described above, providing easy access to the bathroom and laundry room. 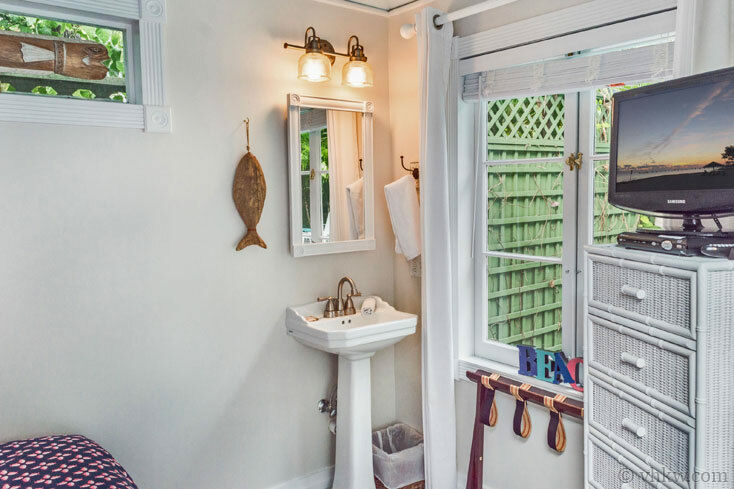 The island-style outdoor shower, next to the cottage bedroom, is convenient and novel way to shower in the tropics that most of our guests love. Grounds are fenced and landscaped to create the perfect outdoor living scene for this one of a kind arts-and-crafts home. Set in a desirable residential neighborhood in Old Town, it is tucked away privately behind a high fence. 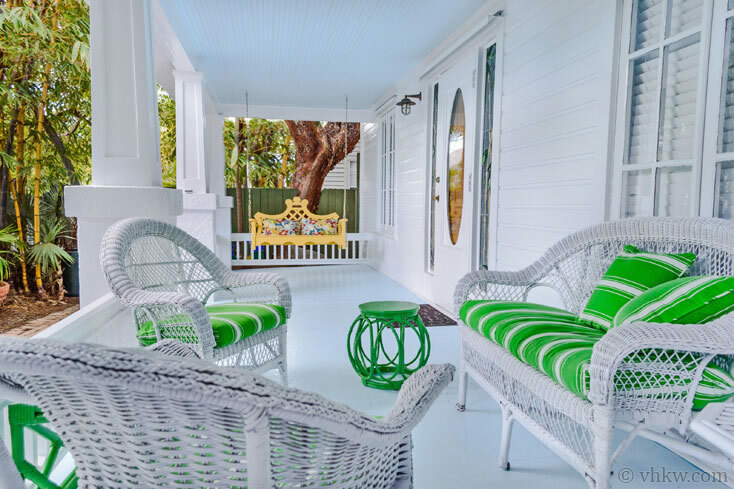 Enter the front gate to see the spacious front porch set with white wicker chairs inviting you to sit and while away the hours. Lush tropical landscaping wraps from the front yard and winds around the left side of the porch with a path leading to the resort-style swimming pool garden. 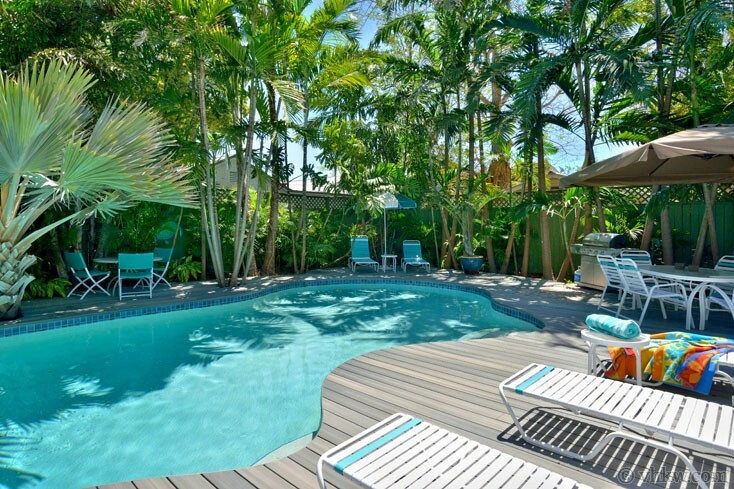 A large free-form swimming pool is surrounding with a generous size wood deck is made complete with lush tropical landscaping and colorful chaise lounges. 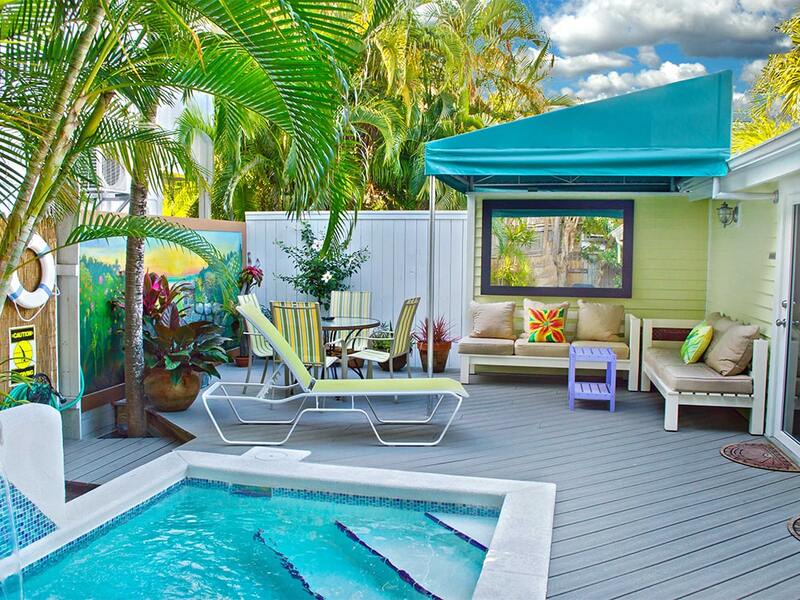 Let your cares wash away with a dip in the pool, then lay back and relax in Key West luxury. 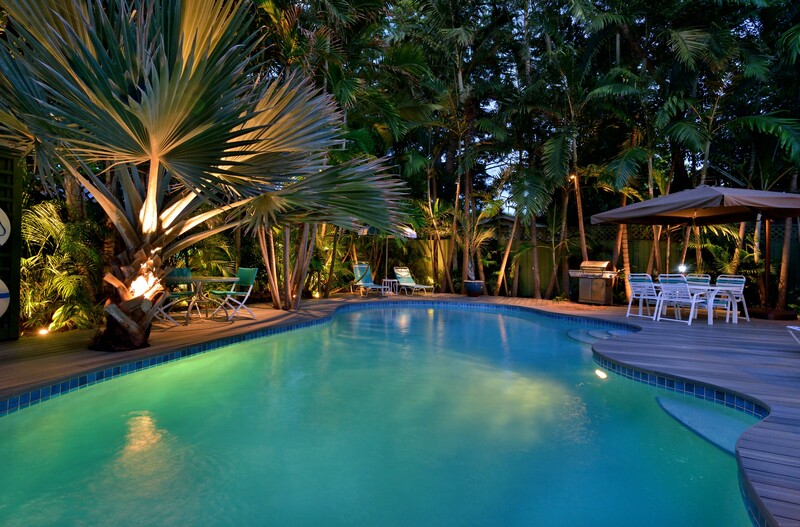 Amenities: Large 40 foot free-form heated swimming pool set in private spacious back yard with lush tropical landscaping. 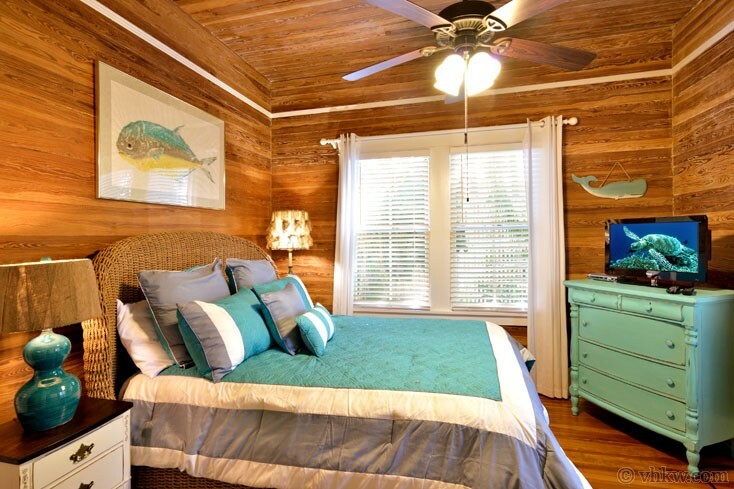 Adorable pool side cottage bedroom. 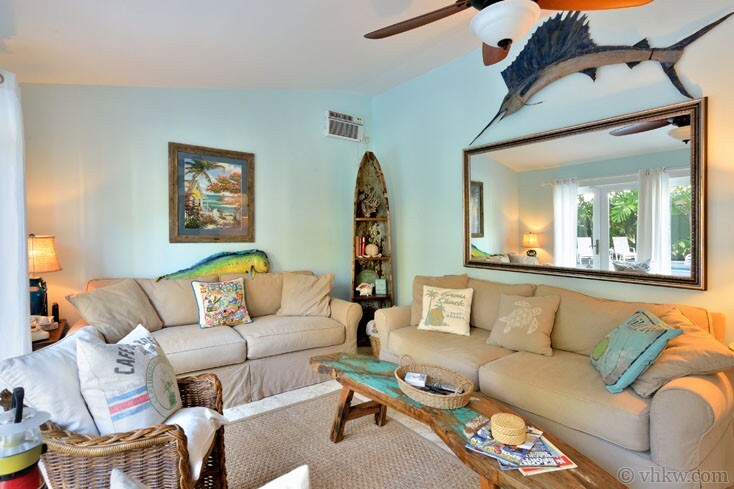 Cable TV, a/c, internet, washer dryer, linens and towels provided, fully equipped kitchen. Great setting for families or a small groups of friends.Activities: Poolside lounging, shopping, fine dining (a variety of national and international restaurants), tennis, boating, beaching, museums, art galleries, night life. 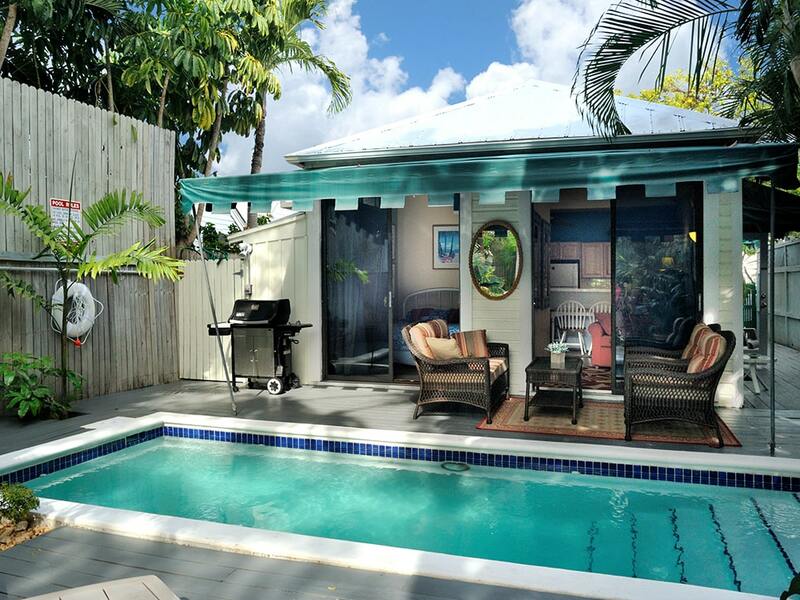 Area: This home is ideally located in the Heart of Old Town Key West in a quiet historic neighborhood just a few steps from White Street and the Truman Avenue corridor. From this location you can quickly walk to Fausto's Fine Food Palace (fine wines, cheeses, and gourmet foods), Sandy’s Café for Cuban coffee, numerous art galleries (White Street Gallery area), and yoga and exercise studios. 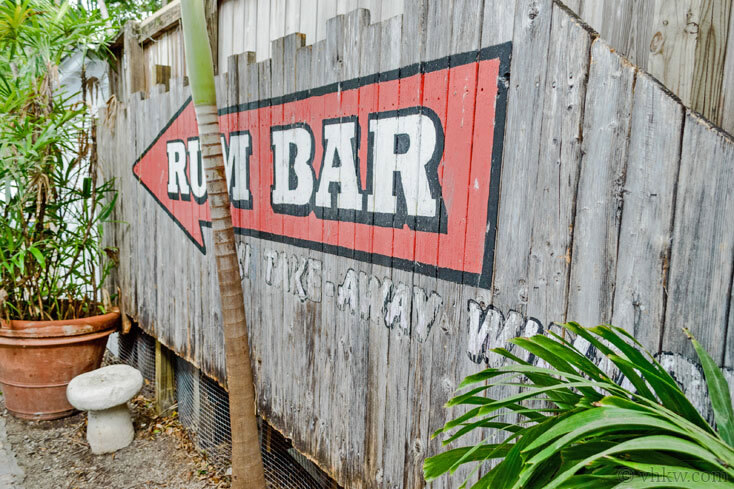 Duval Street shops, attractions, and the Historic Seaport District is a ten minute walk at most. Restrictions: This is a smoke-free home. We do not accept guests less than 25 years of age unless accompanied by a family group or guardian. 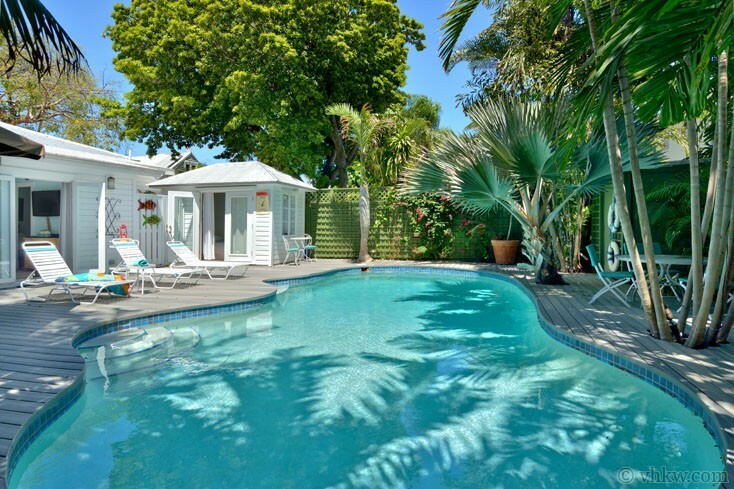 This property is ideal for a family or small group of friends who are looking for a private retreat that is close to all Key West has to offer but understand that it is not suitable for loud partying. Duval Street is not far so it is easy to take your party to the clubs. 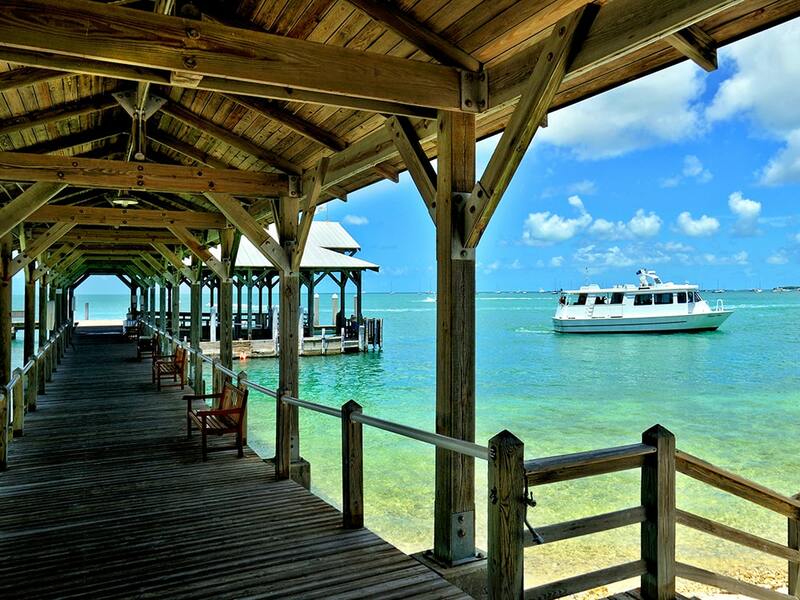 We had planned our trip to Key West in early 2017. So when January 2018 arrived we were thrilled that our trip was here. We were not disappointed. 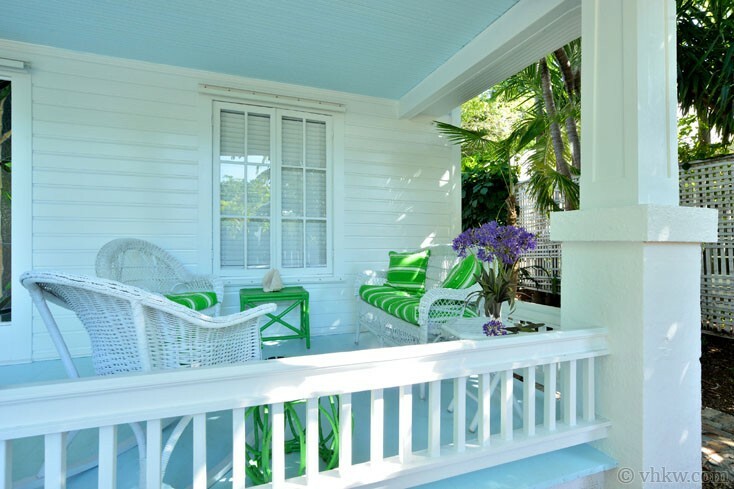 The house was charming and very true to the Key West style. There were 7 of us and we were very comfortable. The backyard with pool was our personal oasis and we spent many mornings and evenings out there. 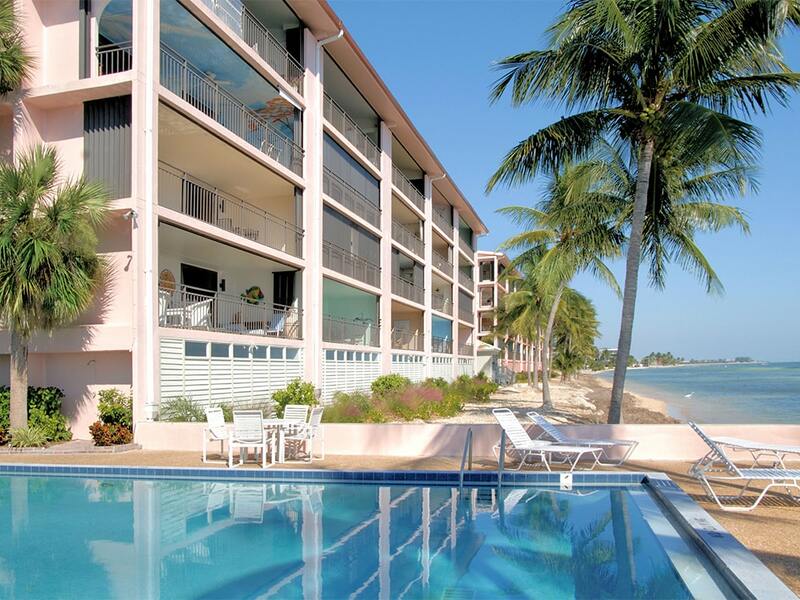 I would recommend Key West and Vacation Homes of Key West to others. We were pleased with our choice and had comfort all along that the team at VHKW would be there if we needed them. Can't wait to come back! The staff couldn't be more accommodating. We had minor issues at the home we rented but George sent someone out immediately to make it right. The house was always clean & well equipped. Would highly recommend going through VHKW for your next vacation to paradise! Our rental was beautiful and we had a great time. Many thanks to the staff, who during their own difficult times with the aftermath of Hurricane Irma, returned phone calls and reassured us all along as to the clean up progress. I cannot praise these people enough for their professionalism while dealing with their own crisis. I would very highly recommend VHKW and will definitely use this company again. Many thanks for such a memorable trip! Property was perfect and exactly as described. The vacation home was everything we could have hoped for. The house was fantastic. We loved the home and the outdoor seating area and pool. It made for a wonderful family vacation! Beautiful home, nice pool and backyard. Well kept house had everything we needed. Thank you for sharing your home with us for our vacation! We had a brilliant time. close to everything. beautiful house, beautiful pool especially at night, only wished we could have stayed longer. We will be back.